CDG Certification Limited provides RoHS certification services in Delhi, Mumbai, Kolkata, Chennai, Bengaluru, Hyderabad & all parts of India. We have gained expertise in rendering reliable RoHS Compliance Certification Services services to our esteemed patrons.ROHS is the screening that provides indications as to whether and where hazardous substances may exist in the product according to RoHS, which is especially suited, for instance, to gaining a quick overview in goods preliminary inspections. ROHS refers for the Restriction of Hazards Substances. It is designed for the restriction of the use of hazardous substances in electrical and electronic equipment (EEE)". Its objective is to restrict the use of six hazardous substances within electrical and electronic equipment Such as Lead, Mercury, Cadmium, Hexavalent Chromium (Cr-VI), Polybrominated Biphenyl (PBB), Polybrominated Biphenyl ether (PBDE). All applicable products in the EU market must pass the ROHS compliance after July 1, 2006. The mandatory requirement of ROHS directive is applicable for the European Union. Any RoHS compliant component is tested for the presence of Lead (Pb), Cadmium (Cd), Mercury (Hg), Hexavalent chromium (Hex-Cr), Polybrominated biphenyls (PBB), and Polybrominated diphenyl ethers (PBDE). RoHS regulations went into effect in the Europe and the UK in 2006. They are currently in place, which means that all electric and electronic equipment being made today must meet RoHS directive rules. 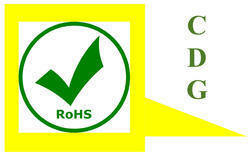 CDG provides RoHS Certification Service in Delhi. The definition and aim of the RoHS directive is quite simple. The RoHS directive aims to restrict certain dangerous substances commonly used in electronic and electronic equipment. Any RoHS compliant component is tested for the presence of Lead (Pb), Cadmium (Cd), Mercury (Hg), Hexavalent chromium (Hex-Cr), Polybrominated biphenyls (PBB), and Polybrominated diphenyl ethers (PBDE). For Cadmium and Hexavalent chromium, there must be less than 0.01% of the substance by weight at raw homogeneous materials level. For Lead, PBB, and PBDE, there must be no more than 0.1% of the material, when calculated by weight at raw homogeneous materials. Any RoHS compliant component must have 100 ppm or less of mercury and the mercury must not have been intentionally added to the component. In the EU, some military and medical equipment are exempt from RoHS compliance. EU legislation restricting the use of hazardous substances in electrical and electronic equipment (RoHS Directive 2002/95/EC) and promoting the collection and recycling of such equipment (WEEE Directive 2002/96/EC) has been in force since February 2003. The legislation provides for the creation of collection schemes where consumers return their used e-waste free of charge. The objective of these schemes is to increase the recycling and/or re-use of such products. It also requires heavy metals such as lead, mercury, cadmium, and hexavalent chromium and flame retardants such as polybrominated biphenyls (PBB) or polybrominated diphenyl ethers (PBDE) to be substituted by safer alternatives. CDG is a leading RoHS compliance certification compnay of India. please contact us for RoHS certification today.